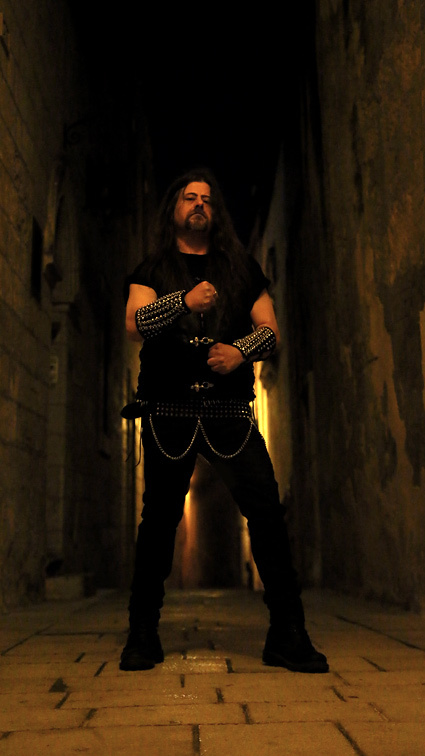 Known for his contributions to the Maltese metal scene as the bass player for doom metal bands Forsaken and Nomad Son, Albert Bell decided to create a solo project for his ideas that didn’t really fit the mold with his other bands. Thus Sacro Sanctus, or more formally Albert Bell’s Sacro Sanctus for those black tie events, was born. Deus Volt is the project’s debut album, sees Albert Bell handling vocals and guitars in addition to his usual bass duties, bringing Robert Spiteri on board for drums. 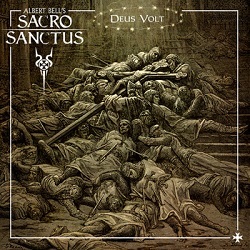 A concept album based on the crusades, Deus Volt was released at the end of 2014 through Metal on Metal Records and features seven tracks over forty-seven minutes. Sacro Sanctus offers an interesting mix of the more traditional doom of Bell’s other projects and pulsing first wave black metal inspired by the likes of early Samael, Root and Venom. It’s pretty evident from the opening riff that Deus Volt is going to be something far darker than Bell’s usual output, as the plodding tempo offers cryptic pulsing riffs amid slow moving hooks. Things do speed up at times with harmonized leads and more upbeat traditional heavy metal riffing, but it always falls back to those blackened, slow moving riffs. Despite the slower approach of the music, there are some utterly crushing riffs on the album, like the heavy handed swagger during “Beatification of the Dead”. The vocals take a bit of getting used to, but the mix of groaned spoken word and gruff, grumbling shouts fits nicely with the primal sound Sacro Sanctus seems to be aiming for. Sure the vocals could use some work, but the rough approach just seems to blend well with the darkness. The drum performance is decent, but not overly outstanding, but it’s not a surprise as this is Bell’s show here. A few discordant and distracting keyboard pop up, like during “Arcana Imperii”, but they really just seem to nuisance. Honestly though, this album is all about Bell’s riffs, so the rest of the instrumentation is kind of an added bonus because it’s played decently. Deus Volt may be a little too doomy or traditional for the average black metal fans and perhaps a little too first wave-tinged for the staunch doom fiend, but fans of amalgamated blends of primeval, blackened heavy metal should take this one for a ride. The blackened pulsing and stellar riffing really make this a great listen. Apparently Bell’s next Sacro Sanctus album is ready to drop sometime in 2016, so hopefully some of the minor flaws get fixed. If not, who cares, as long as he delivers the riffs again. This entry was posted in Reviews and tagged Albert Bell, Albert Bell's Sacro Sanctus, black metal, doom metal, Forsaken Nomad Son, Heavy Metal, Hellhammer, Metal on Metal Records, Root, Sacro Sanctus, Samael, Traditional Metal, Zemial.